Here’s your FREE reflection worksheet from this episode. And here’s your FREE download of the full transcript of this episode. Feel free to share this with your team/colleagues! 1896 is where we start this episode. Don’t worry, if you think my normal episodes get long at around an hour….imagine how long this is going to take! I’m joking – we’re starting in 1896 with an idea, which will quickly evolve into a powerful reflection for you today. You’ve probably seen, either in school or university lessons, or even the rare Linkedin or Facebook meme, that the world’s wealth is quite unevenly distributed. In fact, there are very few individual people who have most of the wealth, which means that the vast majority of people have little to nothing of economic value to their name. This is a pattern has become somewhat of a fascination for economists and regular people alike. It all began with an Italian guy called Vilfredo. I don’t know whether he was smart, but what he taught us didn’t come from smarts but from simple curiosity. He wanted to know, who owned all the land in Italy? So he did some research, and he found that 80% of the land in Italy was owned by 20% of the citizens. Like many ideas, this took time to spread. In fact, it was really through the work of Joseph M Juran, a Romanian immigrant to America, which brought this simple concept to life. During WWII, Juran was seconded to the government to improve supply chain management, when he came across this principle from Professor Wilfredo Pareto. It was Juran who gave it a name – the Pareto Principle – and coined the use of the short hand 80/20, to describe its basic insight. The interesting thing is that Juran wasn’t an economist. He was in fact better described as what we would now call a quantity management consultant, and much to my surprise he is probably responsible for much of the quality management thinking which we credit to W Edwards Deming. Anyway that’s enough of a history lesson to get us started. Since Pareto, and Juran, many others have explored this idea of the Pareto Principle, and found it can be observed in a remarkable number of situations, not always exactly 80/20, but in principle. Richard Koch made it even more famous when he wrote a business book about it. What is the principle here? That there is a disproportionate relationship between many pairs of related but independent variables. For the real nerds out there, it describes a type of power law function in mathematics. The Pareto Principle has been observed in a range of economic areas, like global individual wealth distribution I mentioned earlier, but sovereign wealth, quality defects (few defect types cause majority of quality costs/rework time), innovations (where only a few members of staff will provide the majority of innovation ideas), decision making (where only a small proportion of time in a meeting results in the majority of decisions), and complaints (where only a few aspects of your services will result in the majority of your complaints). Where this gets interesting, is that it enables us to understand how to move away from slow and incremental improvement, to improvement which is disproportional to our time and effort. How do you decide how you spend your time? This is one of the most fundamental reflections in my life, and it seems to resonate with the people I coach and speak with. How do you decide how you spend your time? If that’s a hard one to digest, especially if you are listening to this say on the train early one morning, let’s flip it around. I’m sure you have heard of people talking about the end of their life, right? A bucket list is a list of things someone wants to experience before they depart this world. Bucket lists usually start appearing in peoples thinking and conversation, and on their credit card bills spending their kids inheritance, when they realise there is a finite amount of time left in their life. Motivational speakers often trot out the line “what do you want to be remembered for? What do you want them to write on your headstone?”. In Australia there is a wonderful charity called the Make a Wish Foundation, which effectively exists to give children with terminal illness the opportunity to have a dream come true because their precious time is so limited. You see health and safety already incorporates elements of the Pareto Principle. Risk assessment is based on the idea that we need to prioritise our focus, and resources (including time) on the things which will cause harm. Now this gets into semantics of course, when we start seeing lots of focus in the high probability but low severity types of incidents, chasing slips and band aids and paper cuts. One of the many lessons we learn from major disasters is that we Pareto safety to focus on these more trivial things, and don’t focus enough on the few things which will cause catastrophic incidents (which by the way, is an equally valid application of the Pareto Principle). But it’s not all about risk. As people who are, and have, limited resources, many of us subscribe to the ideas of management systems – create a replicable system for the entire organisation to use, to do things like manage risk. By extension, this involves identifying and enhancing competency, engaging stakeholders in the process, communicating clearly, reviewing and evaluating how we are going, and preparing for and learning from when things go wrong. We Pareto our time by creating systems which should give us replicable results. The thing is, sometimes we lose sight of the decision we made based on that principle, so we focus on the system as the outcome, as opposed to the system being the enabler of the outcome. If you listen carefully, which I’ve only realised in retrospect, you will hear the Pareto Principle at work in so many of the Safety on Tap episodes you’ve listened to. Ep56 ‘Know your customer’ encourages you to get laser focussed on who you are serving – makes sense that they’re likely to embrace what you’re trying to do if you understand and serve them, right? Ep28 and 29 with Rosa Carrillo on Relationship Centred Safety, is based on her Pareto Principle that investment in relationships will give you the biggest return in safety outcomes. Jen Jackson in Ep 22 had a few examples of her Pareto Principle – when you communicate, communicate like a human being. If you spend a little time pointing out the elephant in the room, you will save a bunch of time later not dealing with that issue. Ep23 with Tim Allred talks about leveraging your own learning through reflection – a little time reflecting, means a lot of learning. Charles Jennings expanded on this in Ep 36, explaining most learning comes from experiential and social sources, with information being only a small proportion. His Pareto logic is, focus your approaches to learning with this in mind, and you will get the greatest return. It just keeps going on and on! In Ep 89 I reflected on the idea of creating time and space, and that if you do not much more than bring people together with even the loosest of intentions, they will get great value from that, versus other means of enabling collaboration. In Ep92 you heard me explore some of the emerging research from friends of the show Drew Rae and Dave Provan, which delineates a difference between things we do which actually affect the safety of work, versus things we call safety work which have other purposes. 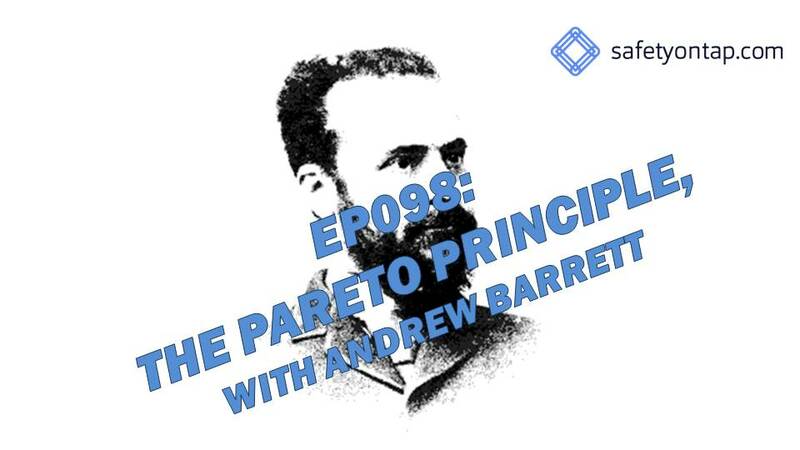 Drew Rae expanded on this idea in Ep95 explaining the term safety clutter, which gives a definition and a name to the sometimes numerous things we do which don’t have any connection with real safety – the opposite of the Pareto Principle. I could go on – it seems like the Pareto Principle emerges in so many things. But not without critique. It’s fair to say that I’m kind of guessing that a concept like the Pareto Principle applies in all these perspectives. That’s true. The thing is that the Pareto Principle isn’t about a clear mathematical rule, always 80/20. It has been proven in lots of different ratios, but the principle stays the same, which is that it shows a disproportionate relationship. This is what I want you to deeply reflect on – the few things that will give you the biggest result. Since you’re listening, you must be a leader, who wants to grow yourself and drastically improve health and safety right? Another critique of the Pareto Principle, which is more of an obvious limitation, is that it is descriptive. It only describes the existing relationship. We know, that workers compensation premiums will drastically reduce if we really well manage a few individual open claims, & focus on a few causes of claims. But that doesn’t help us manage catastrophic risk, because the data isn’t there to support the relationship. That’s where you depending your professional competence will pay off. That’s where you focussing on evidence based practice will pay off. The final criticism of the Pareto Principle, and especially the way I’m talking about it, is that it is reductionist – it’s simplifying what are otherwise complex variables and relationships. Dr Jason Fox an I waxed lyrical on this idea in our chat on Ep 96, which didn’t particularly go anywhere, but that was kind of the point. Not everything can be reduced to a 5 step process, a 6 stage model, or even a few takeaways at the end of a podcast. I accept the reductionist criticism, if that’s what you were thinking, since I have been guilty of generalising it without much support. That was my point I suppose, use it as a thought experiment. However, there is one variable to which the Pareto Principle applies without question. The old adage is that safety people find it hard to show their value, since how can you value the cost or savings associated with things that don’t happen? This is where our understanding of the Pareto Principle links in with another economics concept. In 1748 Benjamin Franklin wrote a letter to a young man, who asked for his advice. Ben’s response was entitled ‘Advice for a Young Tradesman’. Benjamin Franklin is known for lots of quotes. This letter is a beauty, and describes what economics would later call ‘opportunity cost’. Benjamin Franklin is also known for his more succinct quote on the same topic: Time is Money. The economists describe opportunity cost as the relationship between scarcity and choice. When you make a choice, the potential benefits of other choices are no longer available – so they become a cost. Benny Franklin pointed out that the lazy worker doesn’t just incur direct costs of his food and whatever else that day, but indirect costs associated with loss of income from half a days work. As complex as life is, there is one simple variable to which the Pareto Principle applies universally. That, is time. Life is a terminal condition, and it marches on relentlessly towards the end. I know that sounds morbid. But the simple fact is that time is limited, we can’t get more of it, and we can’t get it back from the past. So here’s the thrust of my message. Flip it around. What time have we got. And how are we spending it. What are the few things we can do, that will give us the biggest result. How can we Pareto our time. Two examples from my life might help illustrate what I mean. Safety on Tap is one. I’ve always been passionate about health and safety, and frustrated with my perceived lack of impact. Part of that might have been me doing lots of safety work, busy work, but lots of it saw me using my skills and strengths to help other people. I only have 40 or 50 or shamefully sometimes 60 hours a week to make a difference in the world. Safety on Tap is a mission which enables me to try different things to turn my 40 odd hours into time that influences your 40-odd hours. If you listen to this podcast, and do one thing differently which makes one day of your week more effective, my one day of effort multiples by however many of you as individuals improve for the better. Is it Pareto? I don’t know, but that’s my hunch. I’d love to find out. Safety on Tap is designed to make the world a better place through disproportionate or drastic improvement. It’s in our DNA. The second example is a new adventure for me, a new quest. Two years ago I shared some public reflections and writing about me trying to make decisions about my career and business based on the things that will have the greatest impact. That logically started with small and medium business, because they are the almost-forgotten half of the economy when it comes to health and safety. They employ just as many people as big business, and struggle with what good health and safety looks like, get taken advantage of by snake-oil consultants and scare-mongering regulators. They are confused. I had a good crack at innovation in that space, and realised I was spread too thin, and not getting traction. One part of that small business picture is primary production businesses – farmers, graziers, fishers, growers. This sector is almost always at the top of the scoreboard on fatalities, and the injury and illness iceberg is large beneath the surface of the water. Focussing on this sector was me focussing on the Pareto Principle – the space where I can have more impact. But I was troubled because there is already lots of ‘health and safety’ effort in this space, but the results aren’t changing. To me, it looks like good intentions, translating big corporate approaches to health and safety into scaled down, small, complex agricultural businesses, and a more questions than answers about what good looks like. Long story short, if it wasn’t long enough already, that has led me to spending part of my time launching a new industry collaboration. This is founded by the Rural Research and Development Corporations, whose responsibility it is to invest money on behalf of producers to undertake research and influence practice to drive improvement. Health and safety is only a part of their focus, but a number of changes in this new collaboration will mean we have a better chance of investing limited funding into better applied research which does give us answers to that question: ‘what works?’. Because, you see, we don’t have time to waste. On average, every week, another person dies growing our food and fibre. So I’m Pareto-ing part of my time to focus on that new mission, which I think will have the greatest potential for impact based on my limited time. I’m not saying I have all the answers, rather this is the best fit for my time and skill set to connect the right people, with the right questions, and some money, to create evidence for even more Pareto’s – the few things that will have the greatest impact, across the entire agricultural sector. I’ve written an article which explains this in a little more detail if you want to have a read, the link is in the show notes. You’ve heard some of my suggestions about this previously, like Ep 57 how to find more time in 2018, where I focus on email as one area you can change to get lots of time back – apply the Pareto Principle to one thing to get a disproportionate result. Nat Boehm Talked about this in Ep 70, in the context of health programs, where only a few things will make the biggest impact on your workforce only as long as you understand what those few things are for your specific workforce. And you can even apply the Pareto Pricniple to itself, where if you 80/20 the 80/20, you get 64% of your results from just 4% of your time or effort, kind of like a fractal which is a self-repeating pattern, like a snowflake . An example of that is back to Rosa’s insights about relationship centred safety. If you don’t focus much time on relationships now, starting will give you a great return. That’s the first Pareto. But even inside that change, if you 80/20 which specific relationships you build, focussing on those critical influencers, leaders, decision makers, your results will be even greater. Where does this all come back to, how does it all tie in together? There are certain milestones in our lives which give us pause to reflect, and take stock. In the western world, one of those is in the lead up to the end of the calendar year, and for many Christian and non-christians alike, Christmas and the turn of the new year are two of those specific points. We give thanks. We take a little, or a lot of time off to rest, have fun, and recuperate. We spend time with important people. We buy gifts and we give them freely, openly, and generously to those we love, whether that’s family members, or strangers far away who benefit from our charitable donations. We have gratitude for what we’ve got. We’ve all got the same number of hours in a day, days in a week, and most of us have a similar amount of time in our lives in total. But it disappears every day. I give thanks for the time I’ve got, and have benefited from reflecting on the Pareto Principle, and how I can apply it to my limited time. I hope the small amount of time I’ve taken to prepare this episode, and all of the work at Safety on Tap, has a disproportionate impact not just for you, but the global Safety on Tap community. Is what you are doing now, today, this week, really the best use of my time? What else could you be doing that will provide a more valuable return on your investment of time? How do you decide what’s important? What makes a difference? What will give you a result? How can you become curious, interested, or obsessed with the few things, that will give your investment of time a disproportionate result for the people you serve? Finally, I have great gratitude for you. It gives me great pleasure to hear from your, whether it’s something that I’m doing well, or something I can improve. It all helps me, and helps us get even more connected. Until next time, what’s the one thing you’ll do to take positive, effective or rewarding action, to grow yourself, and drastically improve health and safety along the way? Seeya!